The loyalist paramilitary Ulster Defence Association has expelled Andre and Ihab Shoukri. The brothers are widely believed to be the leaders of the organisation in north Belfast. There has been much speculation about their future after a bitter fall-out with the rest of the UDA leadership. The UDA's ruling body, its 'inner council', issued a statement saying it had expelled a number of members in north Belfast, but did not name anyone. However, loyalist sources said those expelled include the two brothers. 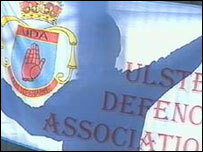 The move comes after allegations by other UDA leaders that the two brothers had been involved in widespread criminality. Earlier this year, it was revealed in court that Andre Shoukri had gambled £863,000 in a Belfast bookmakers. He is currently in jail on remand facing charges of blackmail, intimidation and money laundering. In 2004, he was a member of a UDA delegation which met the then Secretary of State Paul Murphy. Ihab Shoukri has denied being a member of the organisation, and earlier this month charges of UDA and UFF membership against him were dropped when a judge ruled that there was not enough evidence. But senior loyalist and security sources say both men are leading members of the organisation. Davy Nicholl of the Ulster Political Research Group, which gives political advice to the UDA, said the paramilitary group was looking to the future. "There's a great onus on us to move the situation forward," he told BBC News. "The organisation was at pains to point out that it was their duty, as defenders of the Protestant people, to create safer communities which are drug and crime free and where our people can live free from oppression." Sinn Fein assembly member Gerry Kelly said it did not matter to nationalists who led the UDA and other loyalist organisations. "Nationalists want to hear from the UDA and UVF that they are ending their sectarian campaign against Catholics, their racist attacks on ethnic minorities and the drug dealing and other activities they are engaged in," he said. The SDLP's Alban Maginnis welcomed the decision by the UDA, however he said he was still cautious.